From 1909 to 1948, Dubai used 'unoverprinted' stamps and postal stationery of India. From 1948 until 1961, Dubai used the stamps and postal stationery of the British Postal Agencies in Eastern Arabia (listed under Oman in Scott's Standard Postage Stamp Catalogue). From 1961 to 1963, Dubai used the stamps and postal stationery of the Trucial States. 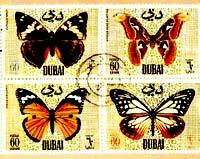 From 1963 to 1972, Dubai issued stamps and postal stationery under its own name. Dubai became a part of the United Arab Emirates on December 2, 1971 and began to use the issues of the United Arab Emirates on January 1, 1973.